There’s been a lot of talk over the last few days about the NLL Award finalists and winners, and how there must be an Eastern bias since many Western players who had great seasons have not been nominated. Some of the awards nominations have been quite surprising: Justin Salt and Matt Beers won the IL Indoor* Transition Player and Defender of the Year awards respectively but neither was even a finalist in the NLL awards. Even more interesting is where the finalists come from: of the fifteen finalists for the five awards so far, thirteen of them come from Eastern teams and all fifteen are Eastern-born players. Clearly this is an Eastern conspiracy, right? Or if not an outright conspiracy, at least evidence of Eastern bias, right? I honestly have no freaking idea. This is at least the fourth time in the past three days I’ve started writing this article from scratch. The first couple of tries were about how there was no bias, but in that case I was looking at the fact that all of the finalists for the awards announced so far were born in the East (Ontario or New York). But nobody cares about that, they care about the fact that the teams they play for are overwhelmingly in the East. It’s too bad though. I had a pretty good Pirates of the Caribbean joke in there. The next couple of iterations explained why there is clearly a bias that must be found and eliminated. But is that really true? There are five Eastern teams and four Western teams, so one would expect that eight or nine of the fifteen finalists to come from the East and the remaining six or seven to come from the West. This year instead of 9-and-6 we have 13-and-2. That seems like an awful lot. But in 2012, eight of the nine awards given out went to Western teams – five of them to the Minnesota Swarm. Did people scream “Western conspiracy!” then? Not that I remember. First off, let’s dispense with the word “conspiracy” right now. There isn’t one. For this to be the case, the Eastern voters (head coach, GM, governor for each team) would all have to call (Skype, email, text, carrier pigeon) each other before the voting and discuss who they’re going to collectively vote for. Since they have more voters than the West, they can guarantee that an Eastern player wins every award – or maybe we’ll give one or two to the West just so it’s not completely obvious. But why? Having someone on your team win an award could be good for ticket and merchandise sales and such, but what’s the advantage to, say, the Knighthawks if a Black Wolves player wins an award over a Mammoth player? There’s no reason for such a conspiracy to even exist so let’s just drop that now. There could be an Eastern bias though. A voter having trouble deciding between a few players may pick the one he is most familiar with – I coached him in junior, I played with him in summer ball, I know his family, whatever. But that’s just human nature. In a totally hypothetical example, say Steve Dietrich votes for Mike Poulin for Goaltender of the Year. Is that because they both used to back up Bob Watson on the Rock? Or because they both used to play for Calgary? Or because they’re both from Kitchener? Or maybe just because Dietrich though Poulin played particularly well this year? Nobody but Dietrich could tell you if any of the first three had any bearing on his vote, and it might be a subconscious thing so even he doesn’t know. But what do you do about that? There’s really nothing you can do. If you look back at the tweet I linked to above, the breakdown for the awards for the last four years was 6-3 East, 5-4 West, 6-3 West, and 5-4 East. Each division won eighteen awards during those four years, there was no clear trend, and it was 8-1 West the year before that. If there is a real systemic Eastern bias in the NLL awards voting that we need to be concerned with, it’s pretty damned recent. I think the real issue is not so much that there’s an Eastern bias to the award selection, and more that players who many thought were deserving were not given awards. I’m curious what would have happened if the nominees for Transition Player of the Year were Joey Cupido, Jeremy Thompson, and Brad Self. All from the West but still no Justin Salt. Would we be talking about a Western bias because Eastern players were ignored, or would we simply be thinking that the opinions of the coaches and GMs are different from our own? Yes, the IL Indoor guys made different selections for some of the awards. But who’s to say that we were right and the GMs and coaches are wrong? Is there an Eastern bias? Yes, unquestionably, because 75% of the players and 56% of the teams are from the East. In terms of players, there are three times as many candidates from the East as from the West. That’s just a fact. This means it’s more likely that Eastern-born players and Eastern-based teams will win most of the awards. But there’s nothing that can be done about it in the short run. The long run solution is to expand investment in Western lacrosse so that someday we have closer to a 50/50 split of Eastern and Western players, coaches, and GMs. We’re also looking at expansion over the next few years, and that might even out the number of teams in each division. Does that alone explain the 13 of 15 finalists being from Eastern teams? No, but it doesn’t mean there’s anything evil going on either. Are the voters biased based on who they’ve played with, where they’re from, and who they’re friends with? Almost certainly, because they’re human. We all hope there’s nobody voting solely on that basis, but it’s also impossible to eliminate it entirely. Is it a conspiracy? No. Do I agree with the awards voting thus far? No, I don’t. 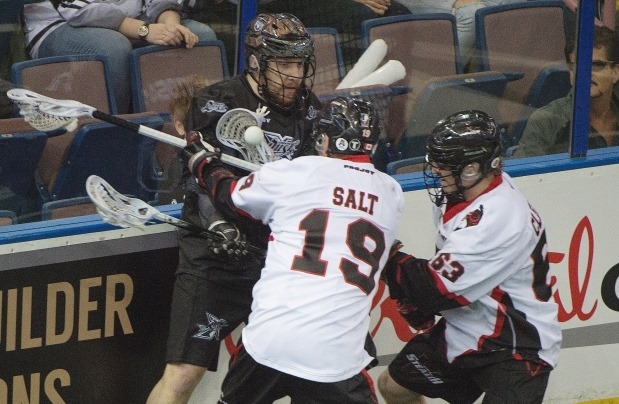 I think Brodie Merrill had his best season as a Rock player, but Justin Salt should have been Transition Player of the Year. The fact that he didn’t win I can live with, but he wasn’t even one of the top three, which is very surprising. I think that fact alone contributed to a lot of the “conspiracy / bias” talk. Latrell Harris had a great debut season with the Rock but I would have put Mike Messenger above him in the Rookie of the Year voting. But at the end of the day, those are just my opinions, and everyone has their own. It’s possible that the coaches, GM’s, and governors of the NLL are, in fact, knowledgeable lacrosse guys who happen to have different opinions than you or me. * – In the interest of full disclosure, I have a vote in the IL Indoor awards.